With classic filter cigarettes, the filter is covered with a cork-colored mouthpiece. Nowadays, some cigarette brands use a white mouthpiece—especially those marketed to a predominantly female target group. White mouthpieces are also used to signify a menthol cigarette in the United Kingdom and a “light” cigarette in the United States. 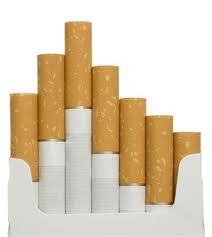 Most factory-made cigarettes are equipped with a filter; those who roll their own can buy them from a tobacconist. Next Does Smoking Relieve Stress?